The kitchen artifacts are exhibited in the front of the green shed. Here visitors can explore the world of women and children on a turn of the century farm. Visitors learn about the cook stove, ice box, and kitchen cabinet. The well water was undrinkable, compelling the family to haul their domestic water from Fort Collins and storing it in cisterns. The historic water wagon that was used is on exhibit in the shed behind the garage. Domestic water was piped to all of Larimer County in 1962. The 1894 house is one of the treasures of the Bee Farm as it is filled with more of the original artifacts and furnishings of the family. Visitors learn the history of the house as it has been changed and even moved to suit the family’s needs. Growth and change over time are ever-present themes at the farm. Arleigh Bee reminisces in the house, via CD, about his life as a child and the hardships that the family faced when they first came to Colorado. The tumultuous 1940’s are depicted in the 1942 house, as one son goes to war and the other son works the farm on the home front. Despite the trauma of war the family grows and prospers. This home shows the difference in daily life as the farm acquires electricity and indoor plumbing. 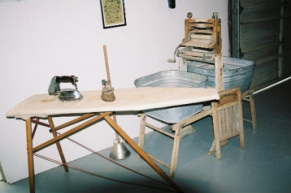 Exhibits of clothing and other artifacts are rotated in the houses and they provide a place to do household demonstrations. Children can wash clothes by hand and hang them on the clothes line as they go to the second home. In 1957 a large six bedroom home was built to accommodate the growing family. It is now a private residence. A third house on the tour depicts the life of the migrant worker as they came to work in the sugar beet fields. In the garage visitors learn how cars changed life for the Bee family and what transportation and recreation were like before and after the automobile.